1. 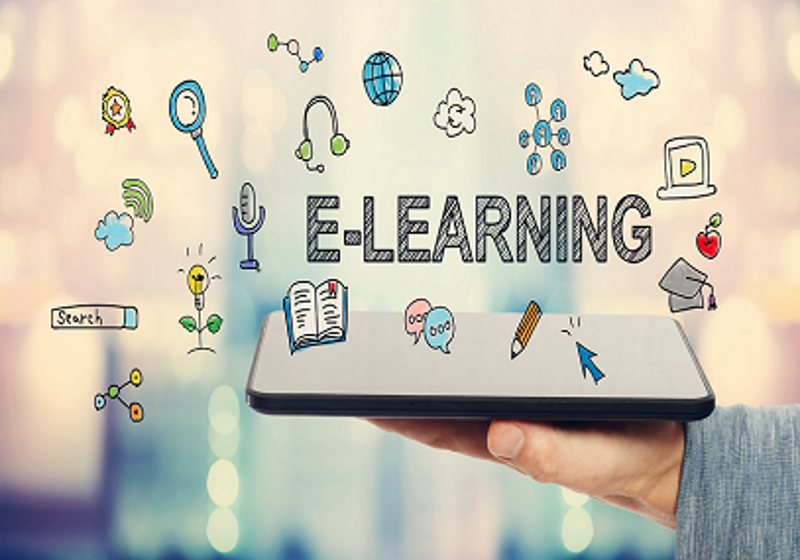 What does e-learning mean? E-learning is defined as "the use of new multimedia and Internet technologies to improve the quality of education and training". Concretely, e-learning is a distance learning mode that provides learners with educational content via the Internet or an intranet network. Most e-learning video platforms allow users to follow the course from any place, at any time and on different devices (desktop, tablet, TV application, mobile...). Access to resources is significantly expands as well as collaboration and interactivity. Today e-learning content is available in different formats, mainly video streaming. Indeed, video is a freer format, more interactive and easier to consume. 2. How did e-learning develop? Widely disseminated since the 1990s, the notion of e-learning first concerned schools and universities: educational websites, educational resource bases, forums and educational groupware. Rapidly extended to the labour market and professional training, the concept then developed with the emergence of the first LMS (Learning Management System) platforms, whose initial objective was twofold: to gather all the published content and to administer the users of this content. E-learning is today the result of the digital transformation that has affected all sectors of activity over recent years, with the digitalisation of the training sector in particular. Nowadays, everyone can put learning courses online to share its knowledges. E-learning streaming platforms allow their trainers to reach a wider and international audience. There are different forms of courses such as explanatory video to explain more theoretical concepts, tutorial video with animations, live streaming video, but also courses via virtual reality and augmented reality. Today, beyond in-company training, there is a real potential for monetizing e-learning courses on the Internet. For example, users can subscribe via subscription packages (SVOD) or buy videos by the unit (TVOD). Online training is accessible to everyone: employees, self-employed or private individuals. The aim is to enable learners to acquire new personal skills, enrich their CVs or boost their professional careers. Indeed, many people are looking for e-learning courses related to their passion, difficulty or current need. Over the few last years many training platforms called "niche" (which means a small segment of a large market) have been created. Indeed, the objective is to find a profitable and uncompetitive market on the Internet. Ex : A Cours d’Hébreu is the first e-Ulpan for French speaking wishing to learn Hebrew. The platform allows a real autonomy in the follow up of the lessons with a reinvented pedagogy. Dealing with situations that are close to reality is a major asset : learners can train and improve. Ex : Standard de Liège. The Kinow solution allows Standard de Liège to highlight via a catalog of videos, the skills of its players and the high quality level of the club, in streaming. Adapt and develop the content for a better relevance and effectiveness of the training. Ex : Streamglish helps you to become bilingual thanks to an e-learning service based on a revolutionary method developed by MIT and Stanford researchers: the TSLL method. This method is the most effective for learning new words, it is based on a combination of video, audio and enhanced subtitles: these are subtitles in original version (O.V) that integrate French translation of important words and sentences to acquire. This feature has been developed and integrated by Kinow. Investments in training are made profitable and sustainable. Indeed, e-learning training allows real-time learning, with sometimes immediate evaluations. It saves on accommodation or transportation costs that represent nearly half of the total cost of traditional internships. Ex : Les Tutos d’Anto. This platform allows you to learn CAM (computer-assisted music) for a reasonable price by buying your courses by the unit or by subscribing without obligation. E-learning is not intended to replace face to face learning. The face to face remains an essential vector for the transmission of knowledge. Indeed, it is easier during face to face learning to capture attention, adapt in real time and create group emulation. This is why it is interesting to combine these two types of learning (face to face and e-learning) within the same training. In brief, it's currently fashionable : e-learning has become an essential dimension in companies: having its own adaptive and pedagogical-playful multi-device system. At home, it is easy to progress with a succession of videos that will allow everyone to progress at their own pace, since the user has control over the pace they want to give to their learning. "E-learning is now to vocational training what PowerPoint has become to any gathering of employees." 4. Broadcasting courses: which technical solution to choose? First of all, in the interest of efficiency, it is recommended to choose a system that has already been deployed (and not just the first pilot sessions). Indeed, choosing a turnkey solution is a wise choice when you do not have technical knowledge. These solutions, deployed instantly, provide enough feedback to measure the effect of training in operational situations (change in learners' behaviour via video statistics, impact on performance, etc.). Choose a quality hosting for your videos in order to guarantee a good streaming broadcast, without interruption during the reading of the courses. It is also possible to set up a device on a reader that allows the user to go back a few seconds to repeat an action or words. Solutions such as Kinow, offer pre-integrated payment modules to monetize part of the content, the possibility of organizing your catalogue into categories, automatic episode playback to make reading easier and even combine quizzes and vocabulary sheets for learners. If you want to launch your own e-learning service, please do not hesitate to contact us!